In the previous post we looked at two-way messaging in RabbitMq. This messaging type corresponds to the Remote Procedure Call (RPC) messaging pattern. RPC is slightly different from the previous MEPs in that there’s a response queue involved. The sender sends an initial message to a destination queue via the default exchange. The message properties include a temporary queue where the consumer can reply. The receiver processes the message and responds using the response queue extracted from the message properties. The sender then processes the response. We managed to set up a rudimentary chat application in our demo project at the end of the post. In this post we’ll concentrate on two message filtering techniques: routing keys and topics. The two are quite similar so a single post is enough to handle them both. Here the client sends a message to an exchange and attaches a routing key to it. The message is sent to all queues with the matching routing key. Each queue has a receiver attached which will process the message – or more than one if you want to distribute the load, see an example earlier in this series. We’ll initiate a dedicated message exchange and not use the default one in the below example. 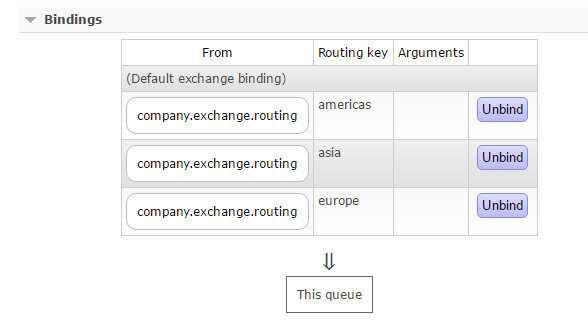 Note that a queue can be dedicated to one or more routing keys. The queue received 3 messages from the exchange, the other two were not routed anywhere since there is no single queue with the routing key “africa” or “australia”. The code for the receiver will be the same as what we saw before in this, alternatively this post, depending on how you prefer to build your receiver: derive from DefaultBasicConsumer or go with the event based variant. Message: The latest news from Asia! Message: The latest news from Europe! Message: The latest news from the Americas! It’s up to the consumer to analyse the routing key and execute some action accordingly. The purpose of this pattern is that we can specify a routing pattern for our queue, sort of like a regular expression, as the routing key it is interested in, e.g. “#world#”. Then the sender sends a message with a routing key “world news” and then another one with a routing key “the end of the world” and the queue will receive both messages. If there are no queues with a matching routing key pattern then the message is discarded. We set up an exchange of type Topic and bind two queues to it, each with a different routing key. We then send various messages to the exchange where each message has a different routing key. Only 2 of the 6 messages will be forwarded to the queue. Can you guess which ones? The other 4 were discarded as their routing key patterns didn’t match any of the queues. In the next post we’ll look at a different message filtering technique called Headers.